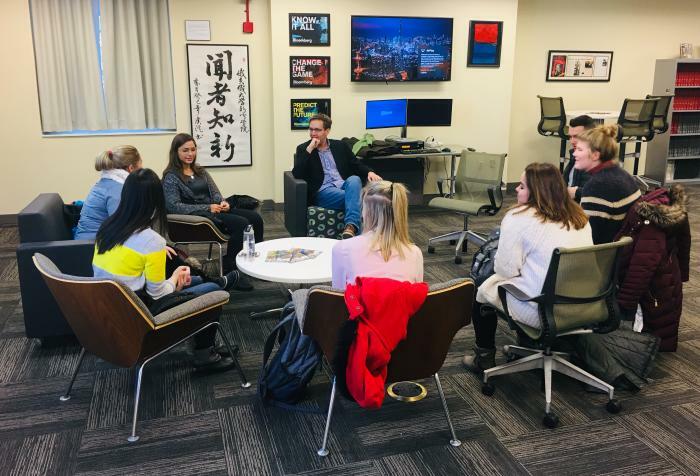 Students in the Scripps College of Communication made the most of their access to Cory Fritz, this semester’s Sloan Visiting PR Professional. During his visit January 21-25, Fritz met with student organizations, stopped by Scripps classes and held office hours for those wanting to learn more. Fritz, who graduated from OHIO with a BSJ in 2007, has most recently served as deputy staff director of the House Foreign Affairs Committee. Some of his previous roles include press secretary and communication director to Speaker of the House John Boehner, and speechwriter and assistant press secretary to Senator George Voinovich. Jerry L. Sloan Visiting Professionals in Public Relations are selected based on their significant and recent experience in public relations. They are able to offer students valuable insight on the current industry and connections with notable E.W. Scripps School of Journalism alumni. “It's really an example of how alumni are committed to helping the school be better at helping our students with opportunities,” Stewart added. Alexa Grillis, a sophomore studying strategic communication, said the program is a great resource that more students should utilize. “It provides an easy opportunity for students to network with renowned professionals who are more than willing to help in any way possible,” she said. Grillis said she has been interested in political communications as a possible career, so Fritz’s visit was helpful to her. Additionally, she was able to network, get career advice and find out what it’s like to live in Washington, D.C.
Fritz’s class visits included drop-ins to Strategic Social Media, Introduction to Advertising and PR, and Ethics, Mass Media and Society. He also held office hours and spoke with several student organizations including Scripps Public Relations Student Society of America (PRSSA) and People Organizing Communication Objectively (POCO). Jordan Kelley, a fourth-year student studying strategic and political communications, said it was a privilege to meet and speak with Fritz. Kelley added that it was beneficial for POCO members and students alike to be able to network with Fritz in such an intimate setting. He said the Sloan Program allows students to take advantage of connections in the industry they are interested in before the job search begins. Fritz said he believes OHIO is the best choice for students because of the resources the university provides: . The club offerings, high-tech classrooms, guest speakers and faculty allow students to thrive. “I always appreciated how OU and the journalism school prioritize bringing in people with real world experience — people who have worked in newsrooms, people who have worked as PR professionals and people who can give you a lay of the land in terms of what to expect once you get out into the real world,” Fritz said.